Victoria, B.C. Europe In My Backyard. Now that we are back in the Seattle area, we can’t just drive 2 or 3 hours in any direction and end up in 4 or 5 other countries. Thankfully, we have at least one that can be reached in such a short amount of time and it has a small slice of European flare too! The city of Victoria, British Colombia. 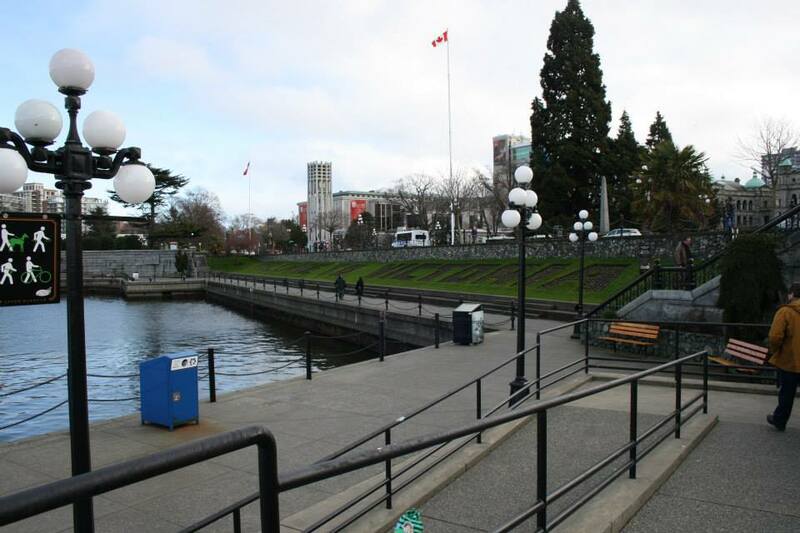 The capital of Canada’s western province, Victoria is just as posh as any European city with more of a small town feel. The historic downtown is very walk-able and full of friendly Canadians. Plus it is also a great “training ground” for young children to practice walking and using their manners while going through an ornate hotel, a parliament building, a castle and museums. There are loads of outdoor opportunities as well! Playing on the Emily Carr monument in front of the Fairmont Empress Hotel. GETTING THERE FROM THE U.S. 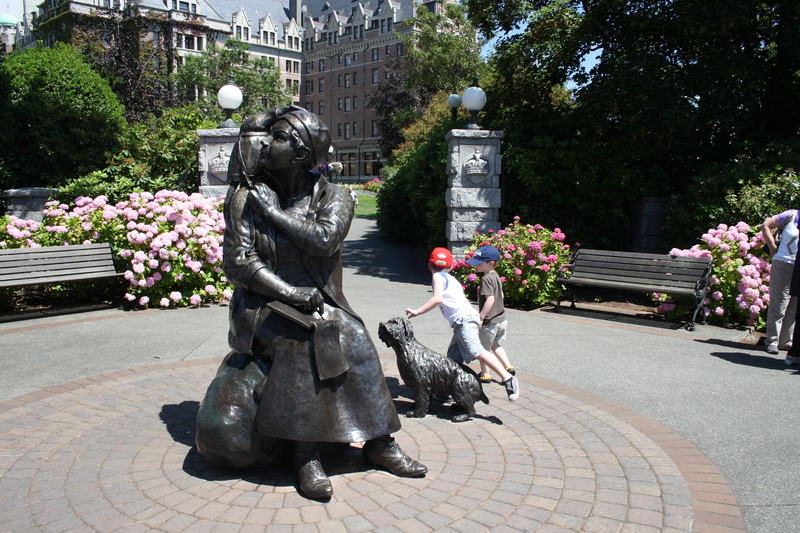 The 2nd time I took the children to Victoria, we went as our whole family of 5 and we decided to drive since we’d be spending a week up in Canada. We drove to Vancouver and took the BC ferries from Tsawwassen to Swartz Bay/Nanaimo. Just note that you then have to drive about 30 minutes down into Victoria from Swartz Bay I couldn’t have been more pleased with the B.C. Ferry trip. It did cost us the gas to drive to Vancouver and then $95 U.S. to cross each way ($190 total), but that was still cheaper than the $425 it would have cost our family of 5 to go round trip via the Clipper. And again, we were going to be gone a week so it was worth it to have our car with us. 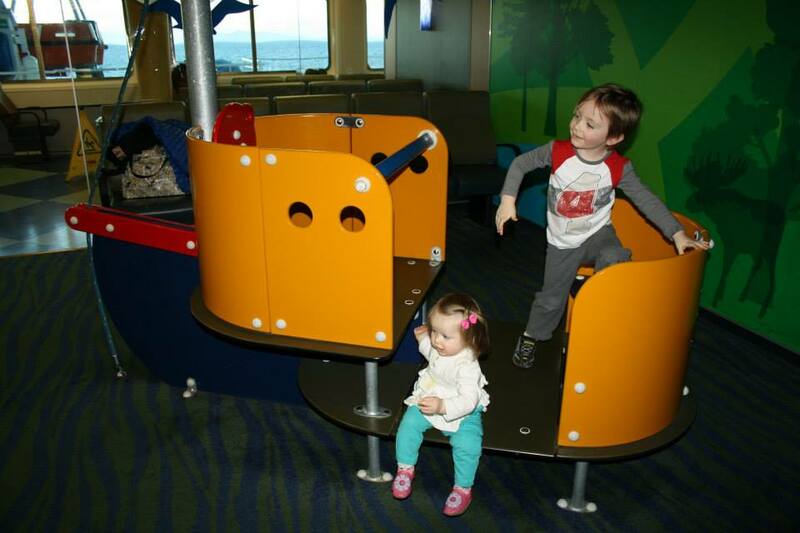 The ferry had a decent food selection and two nice play/climbing areas for the kids! Older kids could also enjoy spending their parent’s quarters in a video arcade. The trip went by so quick with the kids completely entertained by the playgrounds. One play structure on a B.C. Ferry from Vancouver to Victoria. Another playroom on a B.C. Ferry from Vancouver to Victoria. Afternoon Tea at the Fairmont Empress Hotel. I’ve done this twice with our kids all between the age of 6 months old and 6 years old. They put together a lovely stacked tray of goodies just for kids as part of their Prince/Princess Tea service that also allows them to choose either hot chocolate or other non caffeinated fruit teas to choose from. At the end, they get a special certificate with their name on it. 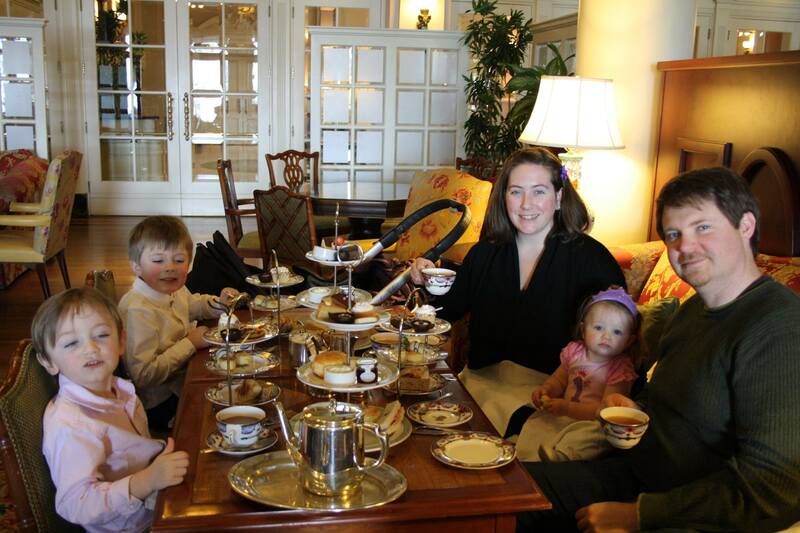 Moms and dads can also enjoy a traditional afternoon tea that is just as good as ones I’ve had in Britain. We chose this location to celebrate my daughter’s first birthday. It was just the 5 of us, but it was a special occasion to see her sitting like a big girl in such a fine room enjoying such a grown up tradition. My sons even enjoy it, mostly for the sweets and hot chocolate! Do make sure you book a reservation in advance if you are planning to visit in December or the Spring and Summer time. They can accommodate for food allergies if you give them advance notice. I myself had a lovely gluten free meal myself. Click here for more information on reservations, menus and prices. Afternoon Tea at the Fairmont Empress Hotel. Just walking around the main marina and the immediate surrounding areas of the Empress Hotel and the Parliament house is what gives this city a European flair. There are plenty of shops and little museums to wander into by foot. The Parliament building is beautiful on the outside and provides some charming rooms on the inside as well. We took the kids on the self guided tour of the inside and walked the lovely grounds. Royal B.C. Museum within walking distance around the inner harbor. Visit the Royal BC Museum. While it’s been several years since we’ve been to this museum, it tells an impressive story of the rich history of native inhabitants as well as large exhibit for natural and human history about the region. 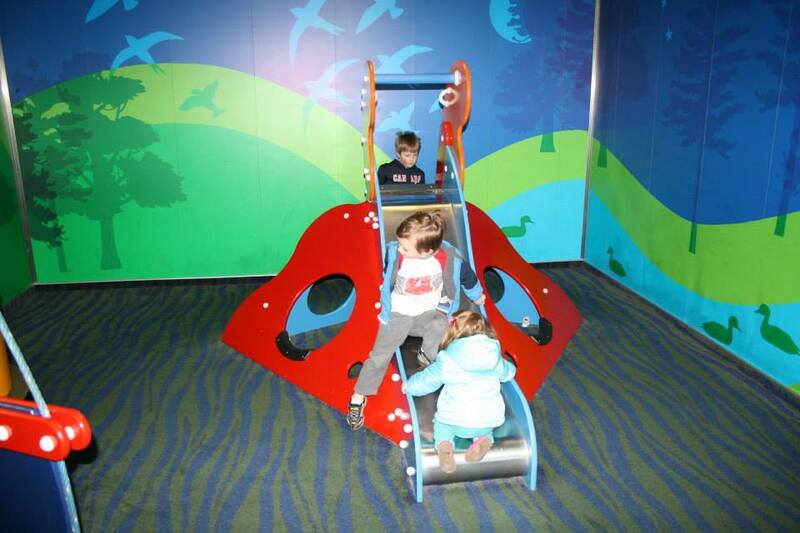 There is also an IMAX that offers regular and children’s programming. Visit a modern castle. Craigdarroch Castle isn’t from medieval times, but it will definitely remind you of the refinement of Victorian England, which is the time period in which the “castle” home was built by Scotsman Robert Dunsmuir between 1887 and 1890. The castle isn’t in close walking distance to the tourist city center, but you can access it with public transportation from the corner of Douglas and Fort Street using bus numbers 11, 14, 15, or 22. Or if you brought a car, you can just drive there. Another charming feature of the city is the horse drawn carriage tours. While this is rather touristy, it is also a very common touristy thing you will see in the likes of Vienna and London. We’ve only done the tour at night and with no children, but have frequently been told by the solicitors and drivers as we pass by their stands they they can fit strollers up in the carriage for families that want to ride but have some extra gear. East of the inner harbor is the Fisherman’s Wharf with several cute boat houses and floating food shops. 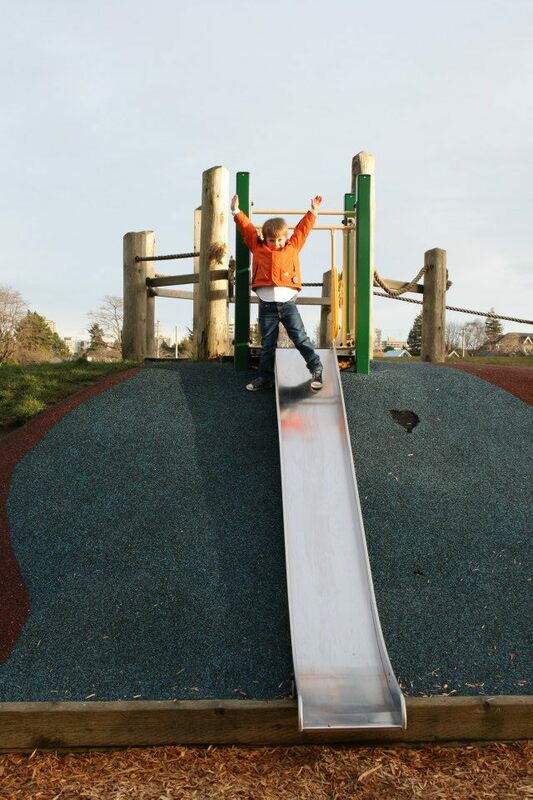 There is also a nice park with a decent playground for the kids to explore. One year, there was a harbor seal that would pop up and you could buy some raw fish from one of the vendors to feed it. But I have not seen one our last 2 trips to Victoria in 2013 and 2014. Big slide at Fisherman’s Wharf Playground in Victoria, B.C. 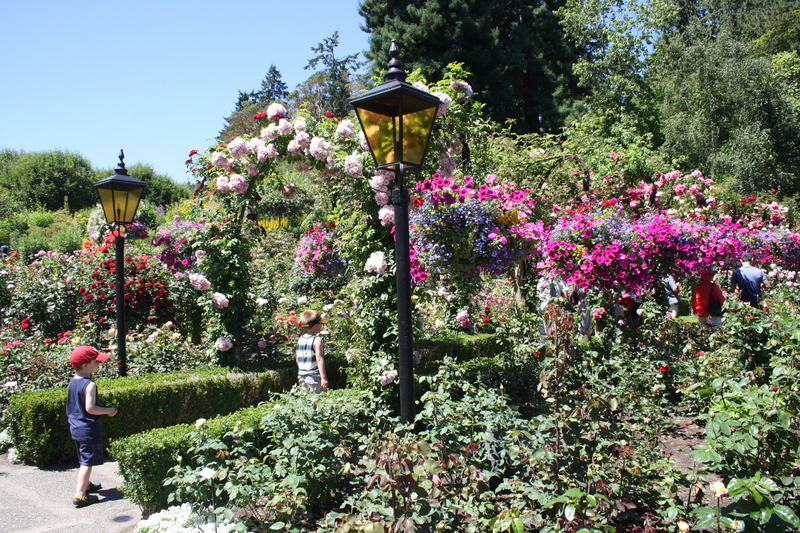 Of course a trip to Victoria wouldn’t be complete without a trip to Butchart Gardens. It is not within walking distance from the other major downtown sights, it is a bit of a drive, about 45 minutes, dependent on traffic. You can go it alone if you have a car or book a tour bus through your hotel or the visitor’s information center at the marina. Even though you are surrounded by all the beautiful gardens that will make you feel like you are on palace grounds, you can still be more relax with your kids here. We have only been in the summer time, but I’ve seen online and been told by friends that they have story book scenes set up during the winter leading up to Christmas. The children exploring Butchart Gardens. These are just the main things that we’ve done in the immediate Victoria city center, minus the Butchart Gardens outside of town. Here are however, some of the things that we really want to go back and do that we have yet to experience. Beacon Hill Park. Located within walking distance behind the Royal BC Museum and Parliament, this is one of Victoria’s biggest parks complete with a petting farm for children. I really look forward to another visit to spend the better park of the day just wandering this space. The reviews sound great and it’s so close to the rest of the city! We keep telling ourselves that we will also one day go into the Bug Museum and Miniature world, both around the Empress Hotel. And of course, we still need to book a whale watching excursion one day!